Thinking of selling online? Online marketplaces could be perfect for you. Here’s our guide to some of the biggest and most successful. They’re websites that help you sell your goods online to a worldwide audience. They take care of everything from listing your items to processing payments. Not sure which one is right for you? It all depends on what you sell. If you’re not sure how to start, try a few for yourself. See which website gets you the best results – one may be a lot more successful than the rest, or maybe using a few different websites will get you more sales. If you've already started selling online, you'll know there are a few practical things to bear in mind, like how much stock you need to meet demand and where you can store it. If you’re sending out regular deliveries, you’ll save money if you buy your postage and packaging in bulk. 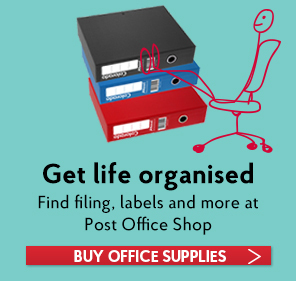 Buying your packaging and postage online makes great sense – you’ll find everything in one place at our Post Office Shop. It’s the world largest online marketplace, with over 100 million users. eBay attracts both private and commercial sellers. Despite being known as an auction site, over 60% of items sell at a fixed price. Chances are, you’ve bought something from Amazon before. When you list your items, you can either pay Amazon per item sold, or a flat monthly fee – plus a percentage depending on what kind of item it is. If you’re interested in selling new or used fashion, the popular clothing brand has its own online marketplace – called ASOS Marketplace. If you’re on the artsy side and love to make things, Etsy is the perfect place to sell your creations. There’s only one condition – items you offer for sale must be handmade or vintage. Gumtree is a lot like an online version of newspaper classified ads. You can list an item, set your price, and wait for buyers. Aside from the quality of your goods, success in online sales depends on great customer service – that means you goods arriving on time, when the customer is expecting. That’s where we can help – we have loads of trackable services to let customers follow the progress of their orders with our Track and Trace tool. And if you're sending parcels regularly, sign up for our time-saving Drop & Go service. How much should I charge for P&P?